True, the pink is a lie. But a UC Santa Barbara research team has honestly just generated eleven new hues using lasers and ion cascades. 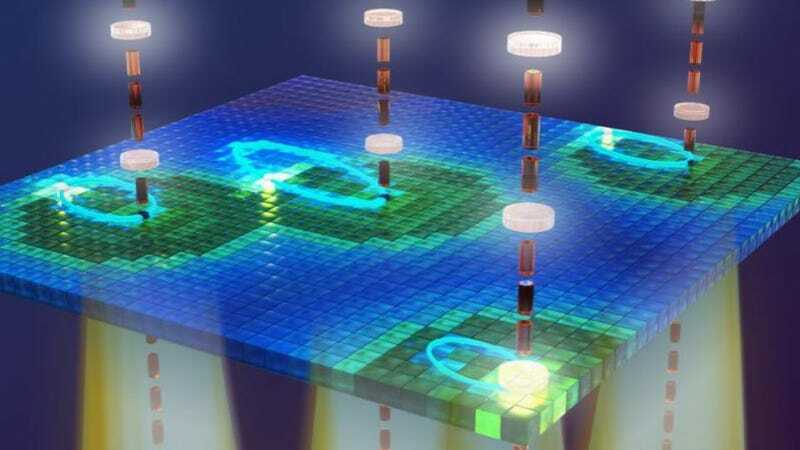 The team created the new colors by aiming a pair of lasers—one high-frequency, the other low-frequency—at a slab of semiconductor material, a gallium arsenide nanostructure. The high-frequency beam separates an electron from its host atom, generating what's known as an exciton (a bonded pair consisting of a negatively-charged electron and a positively-charged host). The powerful, low frequency wave then accelerates the freed electron, which goes crashing into the electron-less atom in front of it. Since the electron has extra energy from the acceleration when it recombines with the host atom in front of it, that energy is radiated as light. Previously unseen frequencies of light. Think of your cable Internet. The cable is a bundle of fiber optics, and you're sending a beam with a wavelength that's approximately 1.5 microns down the line. But within that beam there are a lot of frequencies separated by small gaps, like a fine-toothed comb. Information going one way moves on one frequency, and information going another way uses another frequency. You want to have a lot of frequencies available, but not too far from one another.